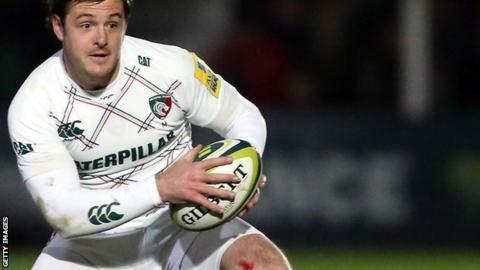 Leicester Tigers boss Richard Cockerill hopes to have injury-plagued centre Matt Smith back within a month. The 28-year-old made his first league start this term in Saturday's win over London Irish, but limped off inside 18 minutes with a hamstring problem. Earlier this month, he came off the bench against Harlequins after three months out with a broken thumb, only to suffer concussion. "We hope in the next couple of weeks he will be fit to play," Cockerill said. "It's probably not quite as bad as we first thought, the hamstring strain is a mild one. That, at least, is some good news." Smith is set to miss Friday's Premiership match against Gloucester and the first Heineken Cup game against Montpellier at Welford Road. While Smith is back on the Tigers' lengthy injury list - which includes Manu Tuilagi, Anthony Allen and Geoff Parling - Vereniki Goneva is expected to comeback from his own lay-off and slot in at centre. "Goneva should be fit for Friday and [Mathew] Tait is not far away so we will be alright," Cockerill told BBC Radio Leicester. "Christmas will soon come and go, and we hope by January or February time we will have bodies back and we can start picking from a full compliment."